College of Veterinary Medicine Biomedical Sciences doctoral student Brett Augsburger has been invited to attend a National Science Foundation workshop on aging, the only graduate student to be invited to this prestigious gathering. The workshop, May 7-8 in Fairfax, Va., will bring together about 25 diverse, internationally-recognized scientists representing physics, materials science, information science and biology to brainstorm about the principles and processes underlying aging. Brett Augsburger (right) and Dr. Michael Irwin. authority on the science of organismal aging. Hayflick studied the processes governing cellular replication and, in 1961 at the Wistar Institute, identified a phenomenon that came to be known as the Hayflick Limit, based on the observation that normal human cells can only divide 40 to 60 times before losing the capacity to divide any further. Researchers later found that the Hayflick Limit is related to the shortening of telomeres, or portions of DNA at the ends of chromosomes that slowly degrade as cells replicate. 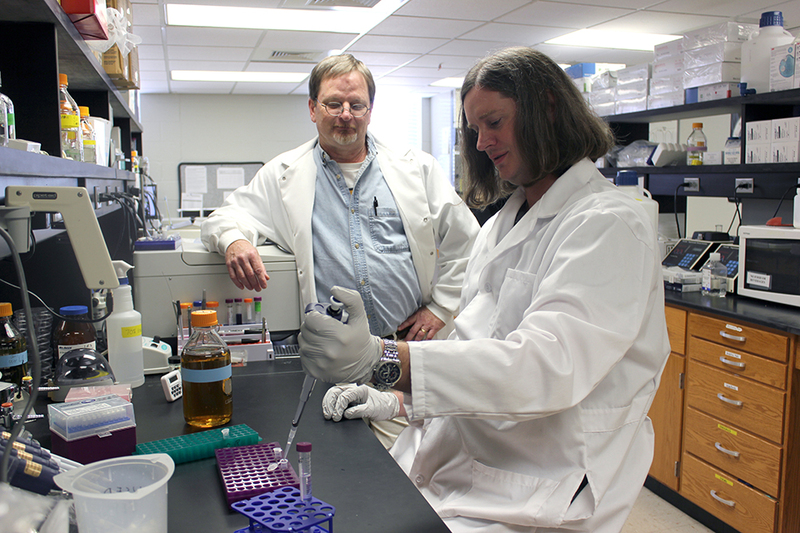 Augsburger is working in the research laboratory of Dr. Michael Irwin, a professor in the College of Veterinary Medicine’s Department of Pathobiology, whose research uses animal models to study mitochondrial dysfunction. “It’s very unusual for a graduate student in this field to write a theory paper, but Brett is not your typical graduate student,” Irwin said. Earlier this year, Augsburger sent his manuscript, “Rate of Aging is Determined by an Organism’s Overall Entropy Management Strategy”, to Hayflick in hopes of getting some constructive feedback. Hayflick was sufficiently impressed by the manuscript that he asked organizers to extend an invitation for Augsburger to attend the NSF workshop. Workshop participants will discuss the relationship between nonequilibrium thermodynamics and aging, the role of information theory in describing the aging process and how this information is preserved in living organisms, and lessons for robust technology development that we can learn from living systems.